Why I Am So Lucky (aka Happy Anniversary To TheAngelForever)! 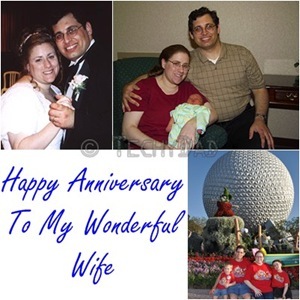 Twelve years ago today, I became an extremely lucky man. There are many ways one can become lucky. You can win the lottery, land your dream job, or meet a favorite celebrity. The way I became lucky was better than all of those combined (though we wouldn’t say no to a winning lottery ticket considering how fast the bills seem to be coming lately). I became the world’s luckiest man because the world’s most amazing woman married me. At the time, I thought I could never love a woman the way I loved B, but I was wrong. As time passed, I found myself falling in love with her more and more. Just when I think this is the deepest anyone could ever love someone, she does something else that makes me love her more. But nothing made me fall in love with her more than parenthood. Suddenly, there were aspects of her that I had never seen before that each made me love her more. There was the tender loving mother who would care for our kids when they were sick or injured. There was the school-teacher-mother who would come up with fun, educational crafts or excursions to go on. And there was the fighter-mother who, when she saw our kids not getting help they needed, went to the mat and fought tooth and nail until they got it. After twelve years, B can still surprise me in so many ways. I love her so much and am so happy that I’ve had the chance to spend this time with her. I can’t wait to see what the next twelve years will bring and what new aspects will make me fall in love with B even more. Happy Anniversary to my wonderful Angel!